This satellite splitter will allow you to keep your factory XM or Sirius satellite radio in your 2004 2005 2006 2007 2008 2009 2010 Audi or Volkswagen or 2008 2009 2010 Volkswagen Touareg when adding an iPod or an Aux Auxiliary Audio input interface. -Cars with the factory installed Navigation radio do not require the splitter unless you are using the Dension GW16AC1, USA Spec PA11-VW6 or factory iPod adapter that uses the CD changer port (non text). Your car has a CD changer connection in the glove box that does not disable the satellite radio. The Blitzsafe, Grom & Dice units all have a glove box version that does not disable the satellite radio. If you retrofitted the navigation radio your car will not have this port. -We have been told that these cars all have the glove box CD changer connection. Please check for yourself and we would appreciate it if you let us know info@enfig.com. 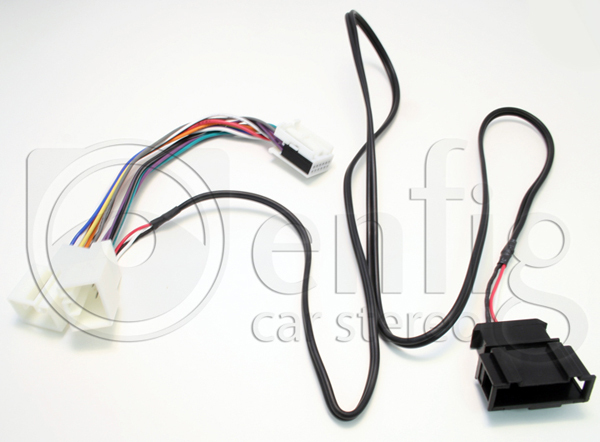 If your car has the CD changer connection in the glove box you do not require the splitter unless you are using the Dension GW16AC1, USA Spec PA11-VW6 or factory iPod adapter that uses the CD changer port (non text). Your car has a CD changer connection in the glove box that does not disable the satellite radio. The Blitzsafe, Grom & Dice units all have a glove box version that does not disable the satellite radio. If you retrofitted the navigation radio your car will not have this port. -Will work with the factory iPod adapter that uses the CD changer port (non text). -Will work with the factory iPod adapter. -The Audi R8 does not require the splitter unless you are using the Dension GW16AC1, USA Spec PA11-VW6 or factory iPod adapter that uses the CD changer port (non text). Your car has a CD changer connection in the glove box that does not disable the satellite radio. The Blitzsafe, Grom & Dice units all have a glove box version that does not disable the satellite radio. We have been told that all these cars have the glove box CD changer connection. -Cars with the glove box CD changer connection do not require the splitter unless you are using the Dension GW16AC1, USA Spec PA11-VW6 or factory iPod adapter that uses the CD changer port (non text). Your car has a CD changer connection in the glove box that does not disable the satellite radio. The Blitzsafe, Grom & Dice units all have a glove box version that does not disable the satellite radio. If you retrofitted the navigation radio your car may or may not have this port. I wanted a way to have streaming Bluetooth audio and satellite radio in my Audi. After scouring the internet for solutions I found the sat pass from enfig. The build quality of the product is incredible. I had some trouble reading the directions and called enfig to get help with the install. The person who helped me had the radio working correctly in under 5 min. Thanks for your help. If you have an audio with RNSE buy this product. I did not know which set of instructions to use. Which Dension model is the AI2-IPDUT-AUX? I received 2 sets of instructions: "...for Dension GW16AC1, 17, 33, F1, P1" or "... for most interfaces EXCEPT..." No info on your website to correlate. Problems: 1) When a call comes in and the phone has a BT connection with the Audi, a very loud static sound comes through the speakers and the caller is not heard. PLEASE ADVISE? Which set of instructions? Other fixes? Music is playing from the iphone through both the AUX and the Lightning just fine.... except when a call comes in and when all the buttons on the head unit stop working.